Often referred to as 'mini-Switzerland of India', Khajjiar is a small town near Dalhousie which provides tourists a unique combination of forests, lakes and pastures. The mesmerising beauty of this place has greatly influenced and inspired many kingdoms throughout the years, including the Rajputs and Mughals. Located at an altitude of 6,500 feet, the natural beauty and picturesque landscape of this place are bound to leave an everlasting impression on a tourist. Khajjiar is known for its nine-hole golf-course which is nestled in the midst of lush greenery and a breathtaking landscape. Khajjiar is a small plateau which also has a small lake which is one of the most favored tourist spots in this town. Khajjiar is surrounded by green meadows and dense forests and it is also known for its beautiful temples. This region also attracts adventure seekers and has a lot of options in adventure sports like paragliding, horse riding, zorbing, trekking etc. Khajjiar is a must visit place for everyone coming to Dalhousie and its nearby regions. However, the way to Khajjiar can be closed sometimes during winters because of heavy snowfall. Visitors can enjoy activities like horse-riding, Paragliding and Zorbing here. House riding is a common activity enjoyed in most areas in and around the town. Zorbing is a more upcoming sport in the area the huge meadows and valleys here provide an ideal place for the sport. However, one can enjoy zorning here, only during the summer months. Also while horse rides may cost a little less, zorbing costs around INR 200-300. The scenic beauty of Khajjiar lake is situated in the Chambal district of Himachal Pradesh. Surrounded by emerald hills and cotton clouds, this lake is a tranquil picture of natural beauty. It is perched on a massive height of 1920 meters and presents a picture-perfect bird's eye view of the surrounding valley. The spectacle of Khajjiar Lake is further embellished with the sight of cedar forests and smaller water streams that open in its crevices. Hailed as 'Mini Swiss', Khajjiar is famous for its paragliding and horse riding activities. The scintillating waters of Khajjiar Lake is a serene beauty that sparkles against the blue of the sky, and you can enjoy its beauty in a number of interesting ways, Take a walk through the landscape as the sun goes down, or visit the Khajinag temple which features intricate wood carvings and a gilded dome. If you're lucky and the sky is clear, you can also catch a glimpse of Mount Kailash from the lake. In addition to this, a number of thrilling recreational sports activities are also available at the service of the visitors. The Kalatop Wildlife Sanctuary is home to a wide variety of flora and fauna. Leopard, bear, deer, langur, jackal, Himalayan Black Marten, Barking Goral and countless beautiful birds can be spotted here. The landscapes are thickly covered with Deodar trees interspersed with little streams flowing into the Ravi river. The wildlife sanctuary was better known as a gaming reserve for Chamba rulers, in history. The area is a favorite spot for trekking, picnics, and nature walks. 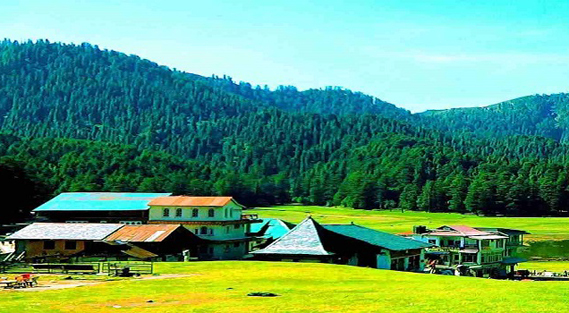 The Khajjiar trek is a 14km trek through landscapes of Deodar and Pine trees interspersed with streams. While the sceneries and views are breath-taking, the trek can be a bit challenging. It is best to do it in an organized structure on a format provided by your hotel or tour provider. Do take a guide or professional with you. Other than this, the Kalatop Wildlife Sanctuary is also ideal for trekking. This is a magnanimous 85 ft statue of Lord Shiva, one of the tallest in Himachal Pradesh. It is polished in bronze and the glistening statue is a sight to behold. The nearby temple also holds a function in the months of June-July, while the statue looks all the more majestic, covered with snow during the winter months.